The Cello Power series is designed to expand cello students’ facility and knowledge of the instrument. Book 1: Thumb Position Duets for Two Cellos is written in treble and tenor clef. Book 2: Cello Warm-ups in Thumb Position includes scales; arpeggios; long shifts in thirds, octaves, and sixths; and diminished chord patterns. 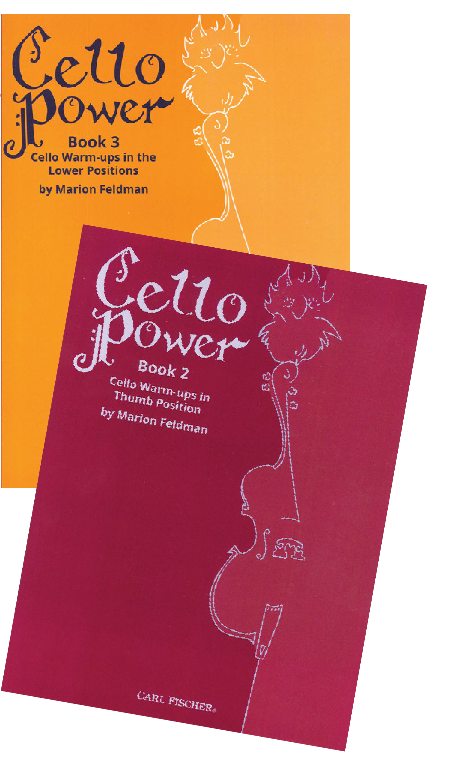 Book 3: Cello Warm-Ups in the Lower Positions is exercise warm-ups of scales, broken thirds, chord patterns, finger patterns in thirds and sixths, and double stops. Completing the series are Book 4: Piatti Caprices: Cello Warm-Ups and Related Preparatory Work for Each Etude and Book 5: Servais Caprices. by Marion Feldman, Carl Fischer, www.carlfischer.com.